This is another of Hasegawa's very simple kits. There is a minimal number of parts, but the finished product looks very good and captures very well the deadly lines of this notorious weapon. 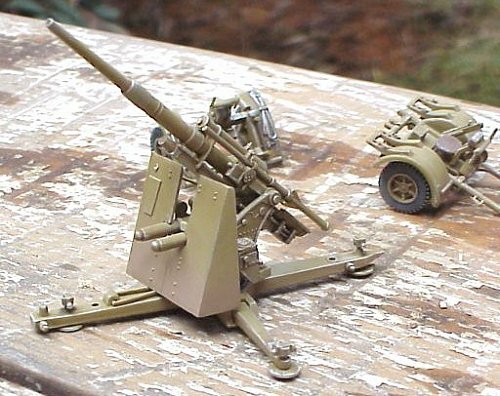 The FLAK 36 is a newer, modified version of the older FLAK 18 kit (MT10). 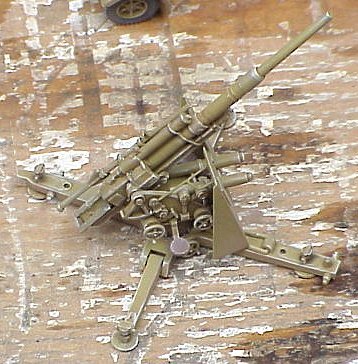 This new kit includes the entire older kit, plus a new cannon barrel to accurately reflect the simplified barrel structure of the FLAK 36. Like most of Hasegawa's older kits, this one is a little short on the details. The gun mounting, the gun stand, and the travel carriages could all use a little more, and finer, detail. As usual, the parts are molded pretty well, with a minimal number of ejector pin marks. The parts fit together very well, with only a single exception. The long rod that is parallel to the barrel on the upper left of the gun (I'm not sure what this part is) does not fit in the opening of the gun shield. It needs to be bent inward a little bit. The kit includes several crew figures of dubious quality, as well as ammunition boxes and shells. The instructions are very well done, as are all Hasegawa instructions. Decals for several different units are included, plus two different styles of kill marks for the gun barrel. I painted my gun in Polly Scale Panzer Yellow, and lightly dusted the lower portions with a light tan. Outside of drybrushing and buffing with my metalizer cloth, I didn't do a whole lot of weathering on it.